WASHINGTON (May 14, 2018)— The Corcoran School of the Arts and Design at the George Washington University acquired hundreds of pieces from the Corcoran Gallery of Art’s permanent collection, laying the foundation for a research collection that will have significant pedagogical value to Corcoran students and also be accessible to the GW community as well as the public. 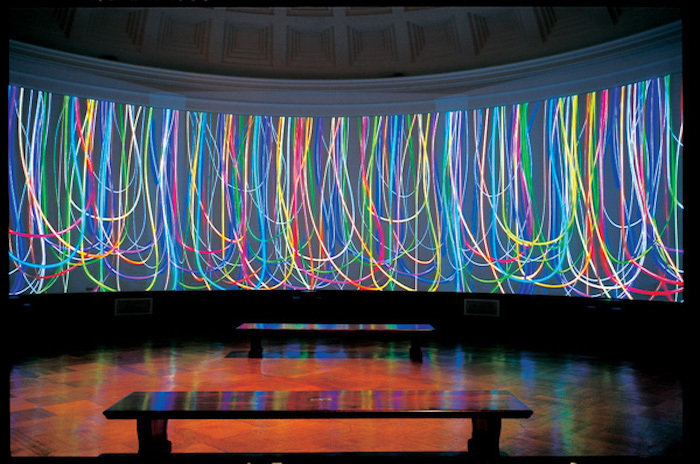 Notable pieces gifted to GW include Jennifer Steinkamp’s ‘Loop,’ a vibrant audiovisual work once on display in the Corcoran Rotunda; Janet Cardiff and George Bures Miller’s ‘The Paradise Institute,” an immersive multimedia experience mimicking a grand, old-style movie palace that was created for the 2001 Venice Biennale; and Robert Stackhouse’s colossal wooden ‘Ghost Dance.’ Among the 18 paintings, 642 photographs, 93 prints, 15 sculptures and more are works by Ansel Adams, Eugene Delacroix, Sally Mann, Mary Ellen Mark and William Wegman. Sethi would like to be able to show “The Paradise Institute” annually in the newly renovated Corcoran Rotunda and the National Gallery of Art, which took custody of the original Corcoran collection, will display some of the works it has acquired in its own “legacy gallery” on the second floor of the Flagg Building. Much of the collection the school will receive is related to the history of the Corcoran and of founder William Wilson Corcoran, including a large oil portrait by William Stone, a series of photographs of the Flagg Building in the 1970s by Paul Kennedy and the original silver and ivory trowel used to lay the landmark building’s cornerstone in the late 19th century. Sethi also hopes the new collection will enable interdisciplinary collaboration by students and faculty not just within the Corcoran School, but across GW from American Studies to Anthropology…and beyond. The university’s established art programs, including the museum and the Luther W. Brady Art Gallery, will have the opportunity for collaborative exhibits, while academic departments will be able to use the pieces as archival and teaching resources. The Corcoran bridges the university’s academically robust programs in the arts with Corcoran’s creative and inspired scholarship. As part of the GW Columbian College of Arts and Sciences, the school functions as an incubator for artists and practitioners in arts-related fields and serves to enrich students who are taking classes in other areas of the university. As such, it provides a platform for engagement that bridges creative expression and practical application with the breadth and depth of the larger liberal arts education. The Corcoran is located at 500 17th Street NW. Visitors should enter via the main entrance, located on 17 Street between New York Avenue and E Street NW. For more information, visit https://corcoran.gwu.edu/.